We are almost ready to bid adieu to the year 2017 and are eagerly waiting for the next year. While we are busy with the festivities of the holiday season, specialists from different fields are ready with their predictions for the next year. And so are the content marketing specialists! Now, before moving ahead with the next year, lets have a look at the previous years and the stats pertaining to the content marketing. In the past years, many organizations have understood and have invested in the content marketing and are showing amazing returns. According to the stats of benchmarks and trends reports from Content Marketing Profs for the year 2017, around 60% of B2B companies reported enhanced profits due to content marketing as compared to the previous years. Well, the credit goes to certain factors such as proper strategy development, better content quality, increase in the time spent on content marketing and better content distribution. Though the growth that was seen in the year 2017 was quite commendable, but it is not just a one time process; content marketing is a rigorous process that calls for regular inputs. And when you are armored with the information of anticipated trends for the next year, you can alter your strategies accordingly. So, now let us discuss some of the strategies that are going to rule in 2018. For the past few years, experts are witnessing a shift away from the usual content production. In other words, flooding your audience with information is not enough; you have to adopt a wider strategy that can easily be customized for various audience segments and the different formats they are using. Now, you are in need of a creative team that not only produces impeccable content but is also good with other skills such as audio editing, video production, content distribution, communication and branding, etc. Brand advertising is a thing of the past as now the consumers are smart and they know exactly what you are doing when you are promoting charitable causes, ‘green’ claims and various corporate supports. What millenials seek is progressive promotions and marketing strategies that are more genuine, transparent and focuses more on giving back to the society. So, if you want to win the trust of the consumers, concentrate on the content that enhances the transparency. It is tough to find even one single SEO strategy that would survive without the content. This year also ‘Content is the King’. When experts are using content in various forms such as social media posts, blogs and articles, podcasts, landing pages, the whole difference lies on the question as to what and how your content is going to attract the customers. According to the market experts, your content should support the buyer throughout the journey, rather than just acquiring the customers. Every year brings new trends and changing the whole setup can be troublesome. But that shouldn’t stop you from creating amazing, interactive and attractive content for the readers. In the end, whatever you create, the success depends on how well the distribution is done. If you want to grab the share from the shark’s mouth, adopt the method of strategic distribution. While these are some of the trends predicted for the year 2018, researching and observing the customers’ preferences is what would benefit you. 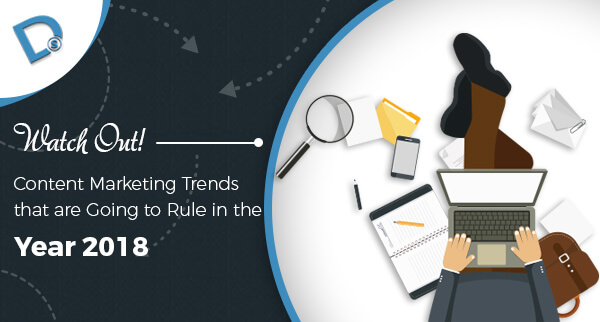 Keep an eye on the trends, trust your own data-and prepare some of the most versatile content marketing strategies for your company. For further updates, stay tuned with us!